With about 50 QSOs and about 30 unique grid squares in the log (most in the ARRL VHF contest) since recently installing a small yagi I can truly say that I am back on 6 meters. Apart from 2 or 3 marginal QSOs made over the last year using a non-resonant HF dipole, my last activity on the band was in 1992. It was then that I dismantled my station for my long QRT period. As I said in my yagi article, 6 meters was one of my favourites. My first experience was ~1974 with a borrowed AM rig (keying the carrier for CW-SSB cross-mode) and a dipole. That was enough to hook me. The next year I bought an FT-101B and found a used matching transverter, the FTV-650B. I operated occasionally until forced to QRT in 1979 when I moved to Ottawa. In 1985 I purchased a used fully-loaded FT-726R and a Cushcraft A50-6 that I mounted at 22 meters height. That's when the real fun began. I still have the A50-6 (I used bits of it to build the current 2-element yagi) but the FT-726R is long gone, being one of the few items I sold during the intervening QRT years. But enough reminiscing! I will now recount a few things about my current setup and how my experience compares to that of decades ago. 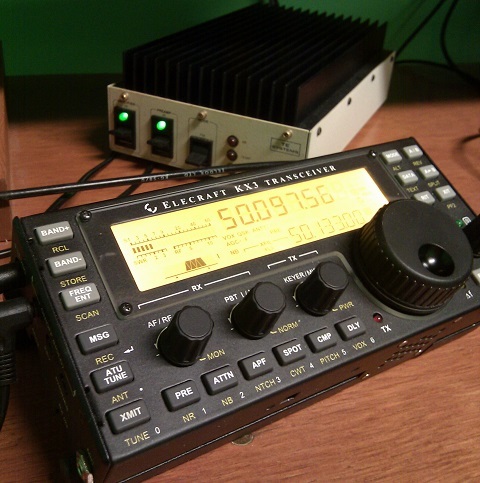 The universality of HF+6M rigs encourages many more hams to at least experiment with 6 meters. The baby boomers are retiring, so there is more activity throughout the day. Many of those same hams, contesters and DXers looking for new challenges beyond HF, have been attracted to the diverse challenges of 6 meters. Global spotting networks alert everyone to openings. This is preferable to having a receiver sitting on 50.125 MHz hissing in the background all day long. There is more CW than I remember. This is good since so many of the openings are marginal. There is significant activity on weak signal digital modes (e.g. JT-65), allowing QSOs that might not be possible even with narrow CW filters. My QTH is not ideal for VHF work. I live adjacent to a major river: the Ottawa River which divides VE2 and VE3. It should be obvious that is a low spot in the local terrain. Since the river is very wide there is no impediment to low-angle radiation over 3 quadrants, ranging (clockwise) between the southwest and the southeast. The fourth quadrant faces a hill and extended ridge line with a local peak higher than my tower about 500 meters to the south. On HF this is not a concern for my operating. For contests the F-layer angle to the US is quite high. Beyond that, there is a negative effect to South America and long path Asia. I can live with that. However on VHF that ridge line blocks low-angle paths to the major source of QSOs. On VHF and up it's almost all low angle work. I often notice others in this area (grid FN25) hearing better than I do. This was also true when I had the larger tower and antenna years ago. Another difficulty which I mentioned in the previous article is the long run (40 meters) of RG-213. This is a poor choice for long transmission lines on VHF. I estimate (not measured) up to -3 db of loss. Coupled with the 8 watts of my KX3, gain loss due to yagi interactions with the HF tri-bander and the modest tower height, I am at a disadvantage. I notice it. 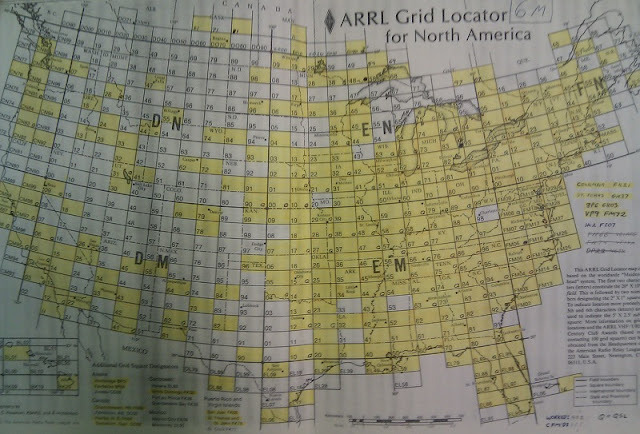 For example, stations worked by others in the same grid are too weak here or not heard at all. I have a deep junk box. It is full of parts and pieces of equipment collected over the decades. Although it's been a while I did remember something I once owned and could not remember selling. Some rooting around in various boxes yielded a small device that was sure to solve my problems. If it still worked. That item is lurking behind the KX3 in the picture above. It's a 30-year old brick amplifier for 6 meters, made by TE Systems (it seems they're still in business). Years ago it was paired with the FT-726R to boost that rig's 10 watts to 170 watts. With 8 watts from the KX3 it would manage around 150 watts. But first I needed to find the manual and the interconnect cables. The manual was found after another 10 minutes of searching, and another 10 to find the power cord with the correct connector for the amplifier. If there were other cables for other functions they are nowhere to be found. Luckily this amp has an RF-sense circuit to switch between receive and transmit. Perhaps it was a miracle that everything worked perfectly, and perfectly together. The +13 db boost ensured that I could work pretty well everything I heard. More power would be overkill since my QRN level on 6 meters is up to S6 (SSB bandwidth) in the most important directions. The KX3's noise blanker does little to improve the SNR on this noise source. The TE amp's LNA is of no value due to that noise. Because of who is on the band you find a variety of operating styles, associated with the culture from whence the ham comes. If it's a contester the speeds are high, the operating fast and efficient. The casual operator, who may have come to 6 simply because it was there to be used on a late-model transceiver, is slower, more prepared to chat and may need reminding to tell you his grid square. The variety is itself very interesting though can cause some culture clash. A recent example is the ARRL VHF contest where some operators would send their name and state, which are not part of the exchange. So I give them my name as well. It's better to reciprocate than to appear rude. Others collect SMIRK numbers, but I don't have one to give. I thing I would like is faster CW speeds by everyone. Although not everyone is capable of it, there is justification for speed. Conditions change fast on 6 meters. By sending at 20 wpm or less it is very possible to not complete the minimum information exchange for a VHF QSO -- signal report and grid square -- not to mention name, state and perhaps more. Among those with better CW skills some will send slower when conditions are marginal with the thought that it is more effective. That's true but often irrelevant if 15 seconds later the opening disappears! Perhaps this behaviour is due to an HF acculturation. Counter to the interesting challenges and rewards of 6 meters is one big disadvantage: time. Time to monitor, time to get on when the opening occurs, and time to catch that seconds-long signal burst for an elusive QSO. It's a good thing that real openings are concentrated from late May through July (Es) and around solar cycle maximums (F). It is no fun to be at the mercy of a fickle ionosphere. I remember one time, two cycle maximums ago, when in mid-afternoon another 6 meter enthusiast called me at work. He held the phone next to the radio, so I could hear the band full of Europeans. He cooly advised me to go home and get on. This was a rare event. After hanging up I fretted. Eventually I gave my boss a semi-credible story, promising to make up the time later, hopped on my bike and hurried home as fast as I could. Luckily I caught enough of the opening to fill the log with plenty of DX. The thing is I hate that: a band that decides when I must operate and not when I want to operate. At least in HF contests it's a calendar event that can be well planned in advance. Be wary of seeing your free time frittered away should you venture onto 6. Even when there is an opening you can spend a lot of time scanning around and hearing nothing. When you hear talk of all the openings during Es season do keep in mind that the majority of marginal. You listen and listen, then you call CQ and call again. Turn the beam a bit and repeat. When that weak signal pokes above the noise and you log one from across the continent or across the ocean it does feel good. However the time involved can be ridiculous. Nowadays it helps that global spotting networks can be monitored on a smart phone so you can be alerted of an opening no matter where you go. Then you have to decide whether to head to the shack to work (or fail to work) someone. Be prepared for the time investment to get the most out of 6 meters. Only you can decide if the rewards are worth it. As I listen and call, again and again, I ask myself whether 6 meters is worth the effort. I am trying to limit the time I pay attention to the band, and I am not shy about tuning HF while also calling CQ on 6. If the band is marginally open, or open to someone not too far from my QTH, sometimes someone will answer. For example, today I worked a few stations on the US southwest (double-hop Es) just that way. By budgeting my time I hope to avoid burning more time than I ought to on 6. But then it's only for another month. Then the antenna comes down for the season. I don't want the additional wind load for most of the year when prospects for an opening are poor. Yet, as I write this, HF conditions are rapidly degrading. This is another reason to give keep the antenna up, by allowing me to get on the air when HF opportunities are poor. Who knows, with the rapidly increasing geomagnetic storm conditions there may even be an aurora opening very soon. CQ WPX Contest: To Love It or Hate It?